AHS Presents School House Rock, Live! Jr. The cast of Schoolhouse Rock Live! 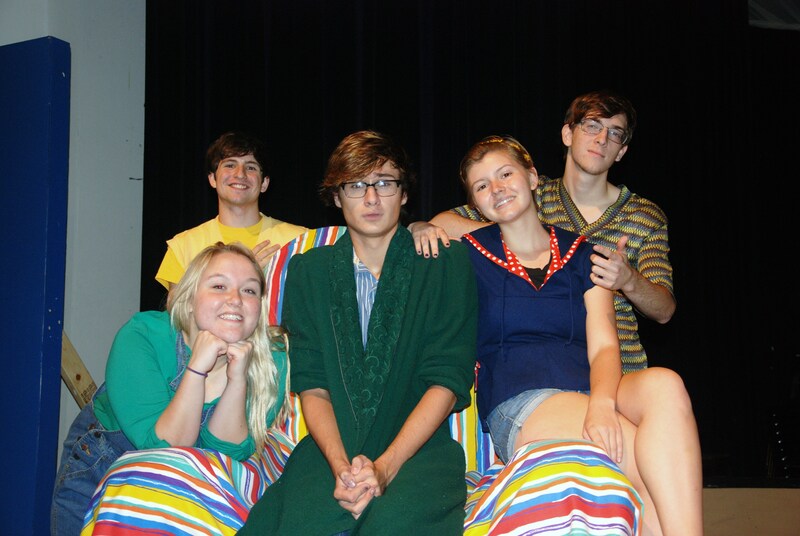 Jr., left to right, are Breonna Jackson “Shulie”; Tim Pope, “George”; Nick Behymer, “Tom”; Parker Chase, “Josephine:; and Matthew Newsom, “Joe.” Staff Photo. Looking for some family-friendly fun this weekend? October 23 through 26, the Mark E. Collins Theatre will present Schoolhouse Rock, Live! Jr. for area audiences. Telling the story of Tom, a nervous teacher on the first day of school, the production features many of the educational songs that the performers’ parents grew up listening to on Saturday mornings. And AHS introduced these songs to a new generation with two school matinee performances for local elementary and home school students earlier this week. AHS Drama Teacher Saralyn Archibald explains that in addition to the audience learning about nouns, conjunctions, and the Preamble to the Constitution, the play is a learning experience for the high school students as well. The cast and crew are also connected to their curriculum during their preparations for the production from building sets (geometry) to researching 1973, the year of the play’s setting (history). Tickets are $10 for adults, $8 for children 12 & under; buy one adult ticket, receive one child ticket free. Showtimes are Friday, Saturday, and Monday nights at 7:00 pm; Sunday afternoon at 2:00 pm. Men’s and Women’s Winners David Haskins and Chloe Biggs. Staff Photo. 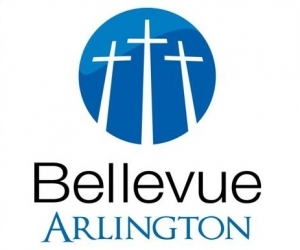 Overcast skies didn’t dampen the enthusiasm at the Arlington 5K, presented by the Arlington Chamber of Commerce with a portion of the proceeds to benefit the Arlington Education Foundation. In Lakeland and Arlington, the focus is on families this Fourth of July. Planned celebrations in both communities feature fireworks, picnics, and children’s parades, among other activities. The Town of Arlington will present the Second Annual Star Spangled Spectacular on Saturday, June 28 at the Arlington Sports Complex on Memphis-Arlington Road between Gerber Road and Milton Wilson. Festivities will begin at 6:00 pm with live music from Super 5. A Panoramic View of Relay 2013. Photo by Jeremy Elkins. A cancer survivor, a loving daughter, an eleven-year old: each has been inspired to battle cancer and lead a team in the fight for a cure. Relay 38002 is Saturday May 3 through Sunday, May 4, from 6:00 pm until 6:00 am in Arlington’s Depot Square (click here for more information and a schedule of activities). Part pep-rally, part community slumber party, this year’s Relay has a global flair. With the theme of “Where in the World is the Cure?” fundraising teams have adopted country names as part of the fun. Already, over $37,000 has been donated to the American through the efforts of the 14 teams participating in the event. UPDATE: As of May 1, the total amount raised is over $60,000. For Lori Kuhuski, Captain of Team Switzerland, and 24-year colon cancer survivor, Relay for Life represents just one aspect of her volunteering with the American Cancer Society. Since 2010, Kuhuski has also served as one of approximately 500 Heroes of Hope nationwide. She explains that Heroes of Hope represent cancer survivors who are “exemplary” in their involvement with ACS. Kuhuski speaks publically about her cancer experience in an effort to raise awareness, to encourage others to get involved, and to share information about treatments. Krista Pearce agreed to captain Lakeland Elementary’s Team Spain — the “Lakeland Leónes for Jaxon Hindman,” (“leónes” is Spanish for “lions”) — in honor of her mother. Pearce explains that when she was approached by Lakeland PTA president Cat Wright to head the team, it was easy for her to accept, although she had never been to a Relay for Life event. “My mom’s birthday is May 3—the date of this year’s Relay—and it is also the one year anniversary of her being diagnosed for the second time with breast cancer,” Pearce states. “My mom is a huge fan of the American Cancer Society because they give so much more support to cancer research than other organizations,” she continues. Pearce’s mother plans to attend the Survivors Dinner. The Lakeland Elementary School team was named in honor of 12-year old Jaxon Hindman, a former LES student and Lakeland resident who was recently diagnosed with brain cancer. “Cancer has touched us all,” Pearce adds. “I’ve had friends lose mothers; there’s just got to be a better way” to fight cancer. 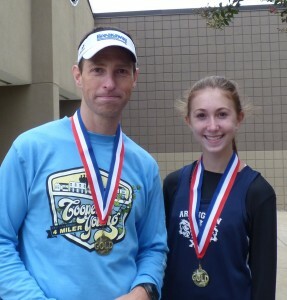 At eleven years old, Haley Pardue of Team France is hands-down the youngest team captain for Relay38002. A three-year veteran of Relay for Life, Pardue couldn’t find a team to join when her former team captain, mom Cheryl Pardue, took a position on the Relay 38002 organizing committee. Pardue admits that there have been “a lot” of responsibilities with being a team captain, including monthly captains’ meetings, recruiting volunteers and (her favorite part) fundraising. Since September, Pardue has organized her 14 teammates—eight kids, six adults—and raised almost $3,900 through yard sales, a “Cheesecakes for Cancer” event, and a Valentine’s Dinner at the United Methodist Church of Macedonia. 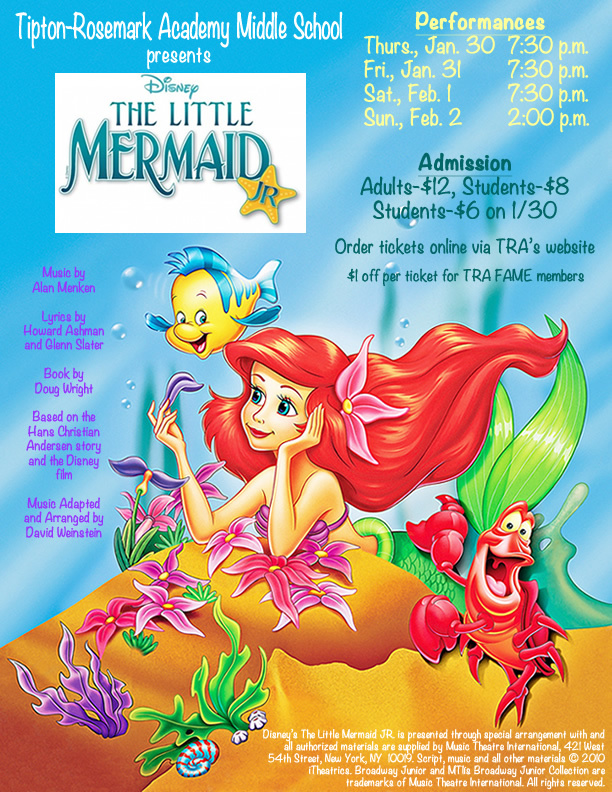 Tipton Rosemark Academy’s Middle School Fine Arts Department presents Disney’s The Little Mermaid Jr. in the TRA Performing Arts Center from Thursday, January 30 through Sunday, February 2. Performances will take place on Thursday, Friday, and Saturday night at 7:30 p.m. and Sunday afternoon at 2:00 p.m. The 65-minute musical, designed for middle-school aged performers, is based on the 2008 Broadway production and the 1989 animated feature film. The TRA cast contains 44 students led by director Todd Goode. “It has been such a blessing to be able to bring a show of this caliber in as our first-ever Middle School musical,” commented Goode. “The middle school students are so talented and have been such a joy to work with. It has also been great to work with the high schoolers, who are now taking on leadership roles in this production and serving as directors, choreographers, and assistants in this show. Please come enjoy the fruits of their labor. I think you will truly be blown away by the talent of this group!”This classic Disney show contains all of the songs from the Academy Award winning animated feature film as well as three new songs from the Broadway show. 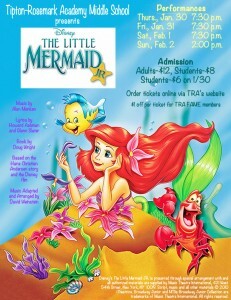 The Little Mermaid Jr. takes place in a magical kingdom beneath the sea, where a beautiful young mermaid named Ariel longs to leave her ocean home to live in the world above. But first, she’ll have to defy her father, the king of the sea, escape the clutches of an evil sea witch and convince a prince that she’s the girl with the perfect voice. Admission is $12 for adults and $8 for students. On Student Night, Thursday, January 30, student admission is only $6. Tickets can be purchased online or at the door the day/night of the show. The Little Mermaid Jr. musical features four Arlington residents. Anna Skidmore will play a Coral Reef, Seagull, Chef and Sailor, while Tyler Flynn will be Chef and Sailor. Sara Grevy will serve as one of Ursula’s tentacles, and Franny Walker will play a Coral Reef.